Users of Hardin MD will notice that the word “pictures” is used frequently on our pages and the word “images” is rarely used. Why is this? Basically, the answer is simple — We use “pictures” because that’s the word people use in searching. 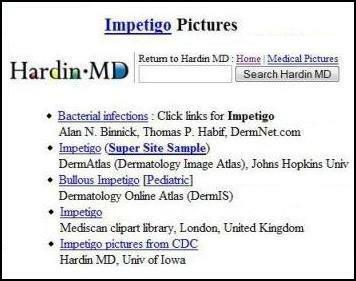 The screen-shots below, for the Hardin MD : Impetigo Pictures page, show this clearly. The Extreme Tracker shot for this page shows the large proportion of search engine traffic from the word “pictures” (36%) compared to the small amount of traffic from the word “images” (0.6%). 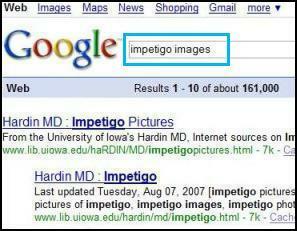 The Google screen-shots show that the Impetigo Pictures page gets an equally high ranking for the two words, so it’s apparent that “pictures” is being searched much more frequently. 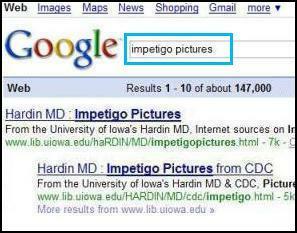 In about 2001, we started noticing how people were finding Hardin MD pages in search engines, and designing our pages to make them more likely to be found. An important part of this was using words that people were more likely to search (e.g. “heart diseases” instead of “cardiology”). Tools such as WordTracker that show how many people are searching for particular words are especially useful for this. About this same time, we were starting to make links to other sites that have pictures on medical/disease subjects. Using WordTracker, and ExtremeTracker (to see words people were searching to find our pages) it was striking that the word “pictures” was very effective. At the time, we assumed that the appropriate word to use was “images,” since that word is what’s used on most medical/disease pages at other sites. 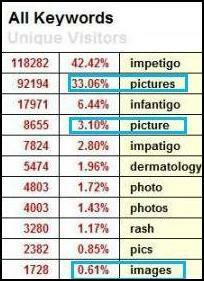 We could see clearly, however, that using the word “pictures” on our pages brought much more traffic than the word “images.” So we’ve gone on from there, and now have high rankings in Google for many medical/disease subjects combined with “pictures,” as with Impetigo. Posted in Google, Hardin MD, PicsYes, Pictures, SEO, Uncategorized.